We went out this morning, wildly optimistically, to look for Giant Puffballs. There are at least two reasons to search out this fungus. It is excellent eating, even with my much publicised ambivalence to materials mushroomy I don't think I would ever turn a slice down. The other reason, of course, is that it's instantly identifiable. You just can't mistake a football sized white ball appearing on the grass overnight for anything else. Naturally, we didn't find any, we're looking about a month too early. What we did find were these. My identification is Clitopilus prunulus, also known as the The Miller in English and Langue de carpe in French. Roger Phillips says these are good eating but there is a slight chance of misidentification with a deadly poisonous species; Clitocybe dealbata or a relation of that, Clitocybe rivulosa. Our fungi are much larger than the usual size for those toxic fungi but the only sure way to tell (in the absence of a friendly pharmacist) is to take a spore print. The Miller should have a pink spore print, the Clitocybes will produce a white one. Even with that reassurance I'm not sure I'd have the nerve to actually eat these mushrooms but we are at least trying the scientific approach. If it turns out my identification is wrong, I'll update here later. And so to Chutney. The tomatoes are still not really getting red although there are some signs of ripening at last. With a quantity of green tomatoes that came off the vines when I stripped the leaves and a handful more we now have several jars of Piquant Green Tomato Chutney for the store cupboard. The only problem I can see with doing this at the height of the season instead of the traditional time at the end of summer is that the apples aren't really ready. I had to make do with immature mealy dry crabs but they worked well enough even though they were fiddly to prepare. If using windfalls make sure they are well washed and all damage and rot is removed. Quantities are not critical in this as long as rough proportions are maintained. 7 or 8 400g sterilised jam jars for potting. Chop the fruit and vegetables up then put all the ingredients together into your large stainless or enamelled pickle pan. Do NOT use a copper jam pan for this, or aluminium either for preference. Bring to a boil, stirring well to make sure the sugar dissolves and then simmer for a long while, stirring fairly regularly until everything is cooked down and the vinegar is absorbed. Continue cooking until it is thick. A spoon drawn across the base of the pan should leave a furrow that takes a moment or two to disappear. Be careful not to abandon your post at this stage as the mixture may stick and burn, not nice. The whole cooking will take at least two hours. Pot into the sterile (cleaned and baked in oven at 100C for 10 minutes) jam jars and seal carefully while hot with clean vinegar proof lids. 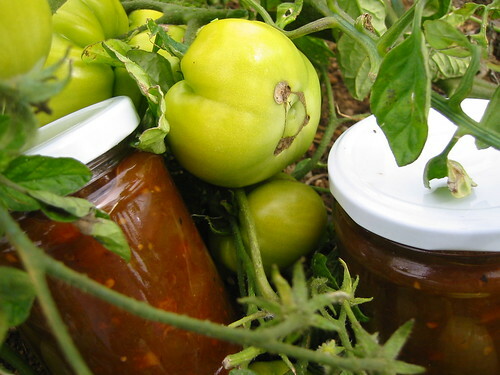 Allow to mature in jars for a couple of months before eating.